I admit that I’m a bit fascinated by Japanese style prints. This example is of a fish pond. The pond has a trio of goldfish or koi swimming around greenery with three smaller fish nearby. The picture is drawn with black lines on a white background. It could be used the way it is but in my minds eye, I see the greenery done in shades of green and the fish a luminous orange and gold as many of them would be in real life, then again, there are many white koi or brocaded carp as well. Maybe even fill in the fish pond with blue or aquamarine to complete the look. 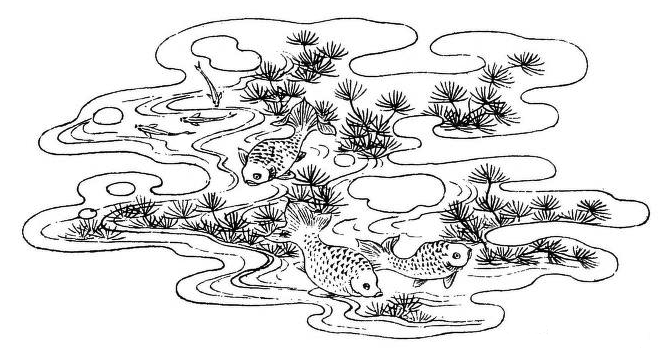 The fish pond image is from a 1887 book on Ancient and Modern Ornaments. It was written by William Helburn. Koi were first bred for their color mutations over 1,000 years ago by the Chinese and in the 5th century as a food fish. Fish ponds and koi ponds were first kept in Japan but after a Tokyo exhibition where the fish were featured, they began making their way around the world.